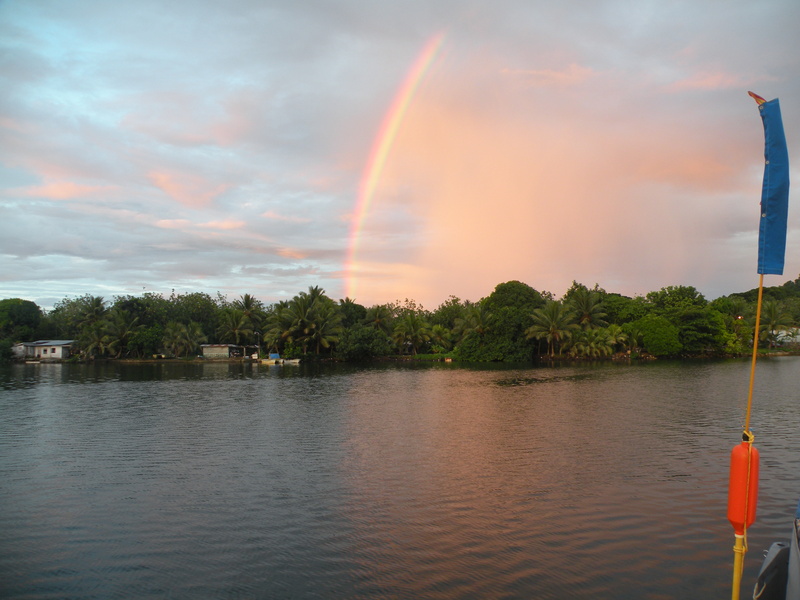 October 8th – day 1 – Leave Majuro – a beautiful day to depart. Wind is gently blowing from the east and we’re finally on our way west once again. Sailing out of the Majuro atoll we saw another sailboat heading in. 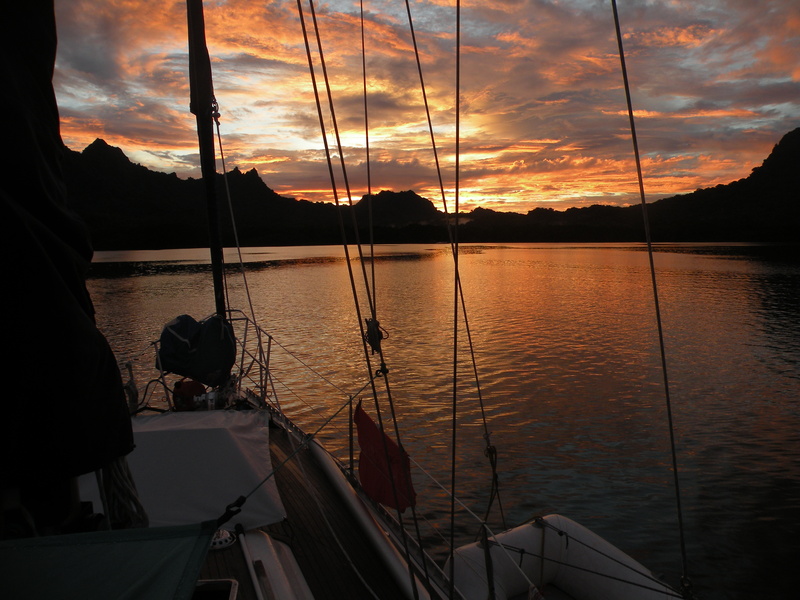 They took 2 months to sail up from New Zealand onboard a Wharram Catamaran rigged very much like some of the Marshallese proas one sees sailing across the lagoons in these atolls. The sailing was pleasant with clear skies and a nice trade wind blowing. By the early evening we were experiencing lightening, thunder, plenty of rain, no wind and on top of that an east setting current which saw us losing 15 miles as the wind completely disappeared and we drifted rather than starting the engine. A mistake. Rain came pelting down for 5 straight hours. Huge thunderclaps overhead and seeing the lightening which scared the hell out of us. We retreated down below and for the rest of the night stayed hunkered down in our berths. What a night. Morning light came and still no wind but at least the rain had abated. By 0800hrs we turned the engine on thinking we’ll head to Jaluit, an atoll to the south. A south wind came up so we headed west motor sailing and trying to make up lost ground and get away from what we thought was backward setting current between the two tolls called Jaluit and Alinglalaplap. It’s frustrating as even when we motor we notice the difference with a 2 knot current working against us and being only able to motor at 5 knots in the best of conditions. Another day of being plagued by lightening and thunder. Wind remains light but we’re escaping the east setting current and making a little progress to the west. 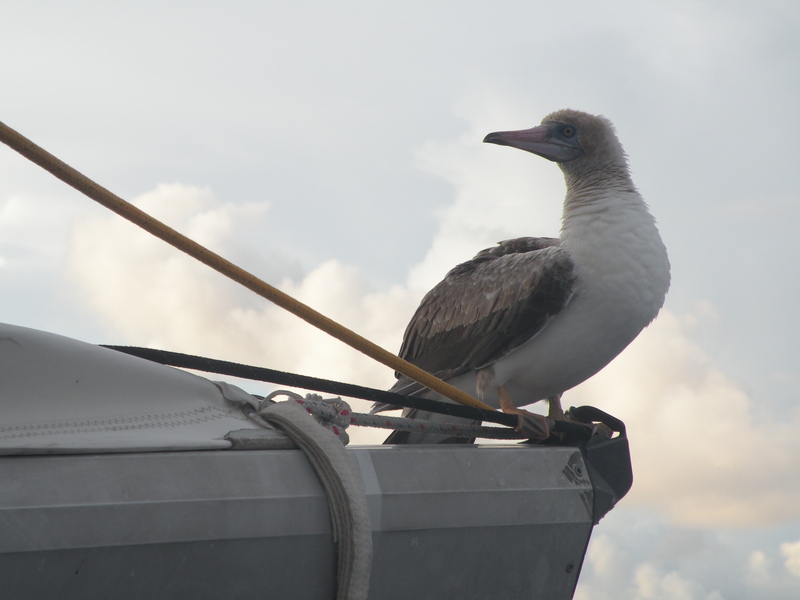 The days highlight was seeing the abundant bird life: seabirds, dolphins and fish but none on our hook! 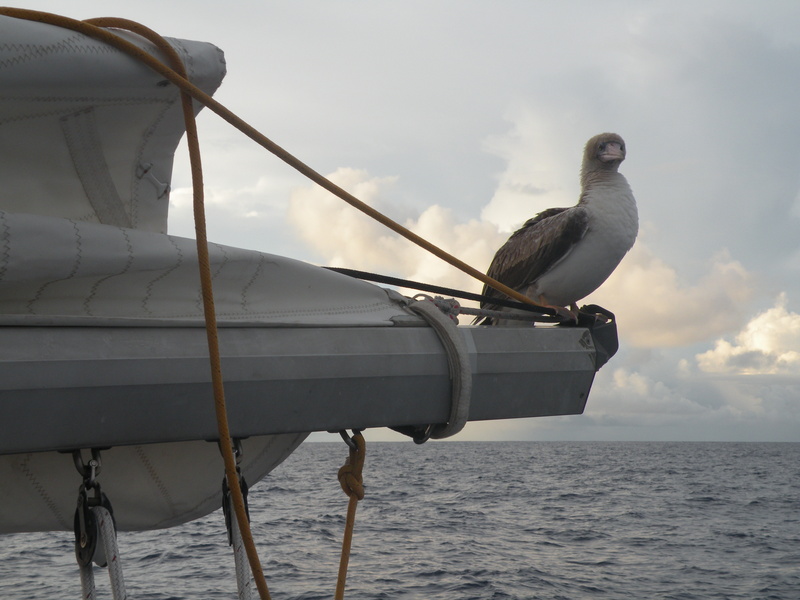 Where else to birds rest at sea? Wind started to pick up as we were motoring and so after a couple of hours with the motor going we shut it off and managed to sail for about 3 hours with a good wind. Then a rain squall went by, took all the wind and now we’re back to motoring again – yuk. When will all this end. God, one wonders what enjoyment there is in all of this. I have just spent the last 2.5 hours out in the cockpit in unbelievable pouring rain. Raining so hard you can’t hear anything but the rain hitting the deck and canvas, the sea flat as a pancake as the rain is pounding the sea into submission and all because we want to go another 500 miles. As I write this I am down below as fed up with the whole process and really wondering if there’s any chance of selling the boat and changing direction. I can’t believe this weather. We’ve got the engine going as there’s little or no wind, the sea is not large but it’s uncomfortable as there is no wind in the sail to stabalize the motion. I’m not really good looking! night preening and sleeping and in the early morning moved over to the top of the radar pod before flying off. We’re waiting to see if he returns this afternoon. However, in these conditions he’s probably smart and flown off to somewhere in the sun! We have another 280 miles to go. At 260 we’re halfway there from our point of origin. However, I don’t think we’re going to see the 260 mark today as soon have to turn the engine off and wait for the wind to return. We just don’t have enough fuel to motor all the way. Scary moment this morning. I was on watch from 0300 to 0600hrs. There was no wind, we were motoring and the sea was quite calm. Getting pretty tired by the time 0600hrs came by I did one more thing before heading down below to wake up Connie and tell her it was her turn at the helm. I checked to see if there were any messages on the satellite phone. No there wasn’t so proceeded below to find water above the floorboards and Connie fast asleep on the settee. Well, did I scream! That got her going pretty quickly as we started to tear things apart to try and figure out why we were sinking. We stopped the engine (which isn’t always the best thing to do if the engine’s going – it can serve as a pump to get water out of the inside of the bilge) and started to bail out the water wondering whether or not we were going to have to get into the liferaft. While we’re trying to maintain our footing amongst the floating debris we’re also trying to figure out how best to try and get ahead of the ingress of water. Soon, using buckets and hand pumps we finally concluded we were winning and in actual fact weren’t going to sink! It still didn’t mean we had a hell of a mess to clean up. Of course it was all salt water and in diagnosing the problem after we cleaned up I discovered that a clamp used to attach the exhaust elbow to the exhaust hose had come undone. Luckily the hose didn’t let go but rather allowed a portion of the cooling water to pass into the boat while some went thru the system and out the stern. That’s why when I was in the cockpit sitting listening to the engine I could still hear water being pumped out the stern so I wasn’t alerted to the issue until heading down below. on whether or not I can clear customs/immigration/agricultural and the church police! I do wonder about the challenges you two set yourselves sometimes but so happy you didn’t sink. 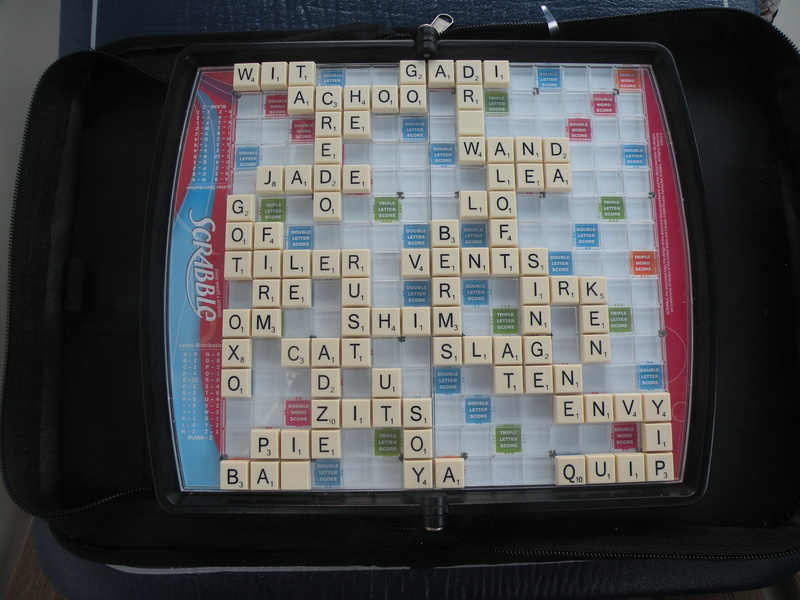 By the way, whoever put ‘zits’ down for a scrabble word is pushing the envelope. Tell me you aren’t really in Victoria just making all this up….lol. Oh my, you poor guys!!! You make me so grateful for our land yachat! We have had lovely fall weather for a few weeks but it is about to change tonight to rain and wind. Jan, of Baja Winters and her granddaughter- age 25 something are coming for the weekend to visit… then we are out at Glenrosa for a week to sheep farm sit while Peter and Jane go to Ontario for a wedding. As far as we are concerned, you can come home anytime!! I hope you’ve checked all your other hose clamps by now! Wow. I’m glad you are as competent as you are bold; well done getting yourself out of danger and into port. 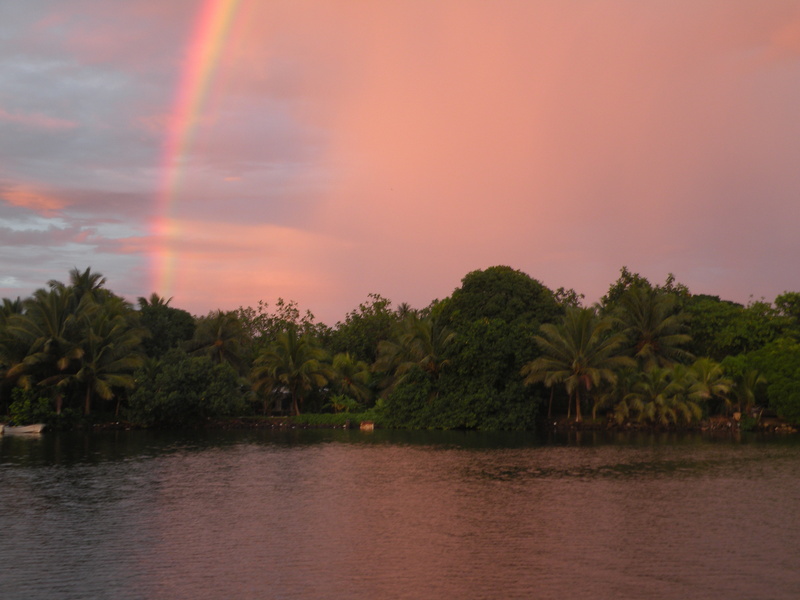 I hope you are enjoying rewards of arriving in Kosrae now. Land-life: There’s a slow leak in my bike tire, I have to dodge cars on the commute, and I get no sunset or island views in my little office window…. Whew! Glad it wasn’t a thru hull or something else. We’re in Turtle Bay and enjoying the sunshine. Hoping for some Dia de los Muertos action tomorrow.